As you drive down the A386 towards Tavistock you will come to the little village of Sourton in which there are two things you will notice. The first is the Highwayman inn and secondly, opposite on the green is a large ‘standing stone’. You may be forgiven for thinking it was an ancient form of advertising stock cubes by the name of ‘Oxo’ but in fact it is thought to be a 10th century Christian stone. This is one of four known early Christian stone in the area, the other three being; Sourton Cross, The Honest Man, and The Sticklepath Stone, all are now sited along the old Exeter to Tavistock road. Of the four stones, it is fairly certain that none of them stand at their original sites, and as far as The Oxo stone is concerned this was found at East Linnacombe which is near Okehampton. The old road by which the stones stand would have been a busy route between Tavistock Abbey and Exeter or travellers going on to Cornwall. 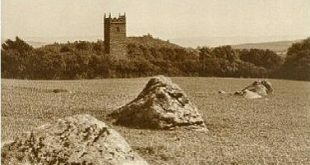 The actual stone which stands on the green was in fact, as mentioned above, found at nearby East Linnacombe and was erected here in 1985. The stone was first repaired by the Dartmoor National Park Authority and then set up on its present site. The stone stands at 1.73m and has a girth of 1.02m although there is no record of its original measurements. Various sources have dated the stone to around about the 10th century although there is no mention of how this date was arrived at. As can be seen in the photo above one face has what appears today to be an incised cross, an ‘O’, an ‘X’, another ‘O’ and a semi-circle. The other face of the stone has a circle and cross incised, below which is another circle. As to the meaning of the symbols, it can be assumed that they are of a Christian origin but what purpose the stone served is a mystery. Perhaps it acted as a waymarker or preaching stone but sadly as its original location in unknown nobody can say for certain.